Click here to book Stephen for your event, conference, or corporate engagement. As a professional speaker, Stephen presents and teaches to thousands of professionals around the world each year. He specializes in breaking down complex technology-based subjects while bringing an energetic, engaging, informative style to every audience. 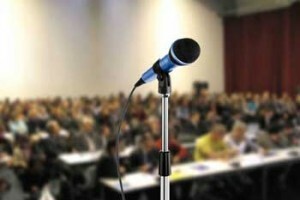 His straightforward presentation style encourages audience members to participate, ensuring that everyone leaves the classroom with knowledge that they can immediate implement into their lives. Wherever you have a professional audience in need of information and education on technology topics, Stephen is ready to give them a presentation that will leave them excited and grateful for their time in the classroom. At the 85 to 100 live events and countless webinars that Stephen presents at each year, he brings an absolute commitment to promoting a highly interactive environment to entertain and inform his audiences. Using audience discussions, polling questions, and useful tips to supplement his detailed visual presentations, Stephen covers a broad array of technology-based topics with the goal of each attendee leaving inspired and informed. Stephen wants each and every person to leave the classroom with an arsenal of new ways that they can use technology to transform their personal and professional lives. Where is Stephen today? Click here to check out his upcoming events calendar. What Stephen’s audiences have to say. Interested in offering one of Stephen’s seminars? Check out some of his current courses below. With the amount of information in the world doubling every two years and the average worker’s skillset expiring in less than seven years, the facility and manner in which we conduct our jobs is changing significantly. Technology and innovation continue to expand, in their wake creating new jobs, markets, and opportunities, but only for the people that lead the charge. In this presentation, Stephen will give you an in-depth look at the current technologies available to transform your practice and highlight emerging technologies that will change the future for financial professionals. Beginning with a discussion of technology trends and why it’s important to stay current with major developing technologies, the course will then move to crowdsourcing, e-commerce, and business intelligence. We’ll also look at how harnessing data can provide unique and powerful insights for better decision making, giving you information and knowledge that you can begin to use in your practice today. Identity theft is the fastest growing crime in the United States, with approximately 10 million occurrences every year. On average, it will cost the victim several hundred dollars and dozens of hours to resolve. It can cause irrevocable damage to an organization’s reputation and finances and change public opinion. This course will examine the major causes, factors, and outcomes of identity theft and organizational security breaches. Participants will be presented with current examples from a wide range of industries and attack types. 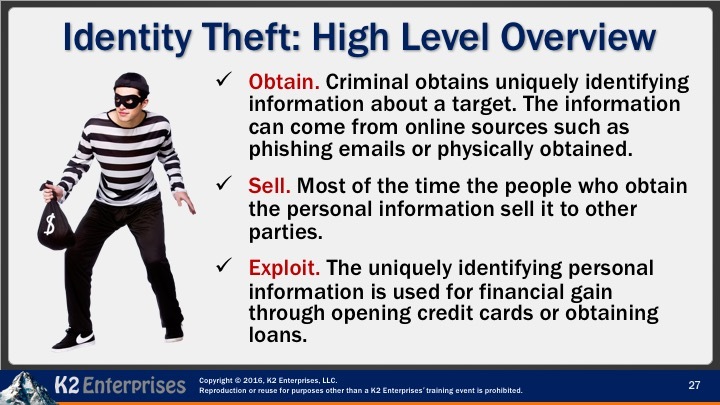 You’ll learn how to identify when theft occurs, what information is most at risk, where the stolen information is used, and best practices on how to prevent it from occurring. The Insider’s Guide to Information Security & Avoiding Identity Theft is recommended for anyone concerned about their online safety, especially those responsible for safeguarding their organizational data. The Internet and mobile technologies have revolutionized the way that businesses operate. We’re no longer constrained by having to operate in a specific location or during regular business hours. Organizations can now effectively communicate and do business with customers and staff based anywhere on the planet. 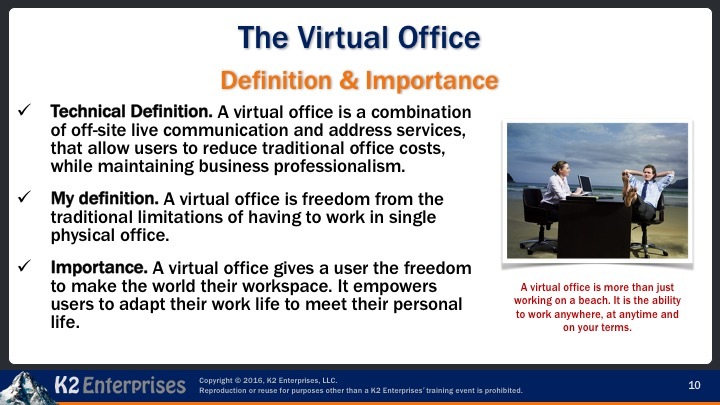 One of the most important aspects of this changing workplace is the virtual office, which allows a user to work anywhere in the world. This course is an in-depth look at how an organization can improve collaboration, communication, and operations by implementing virtual office technology. We’ll look at solutions to simplify and streamline communications, business process management, going paperless, and more. We’ll also cover the benefits and risks of implementing a virtual workplace and discuss innovative technologies you can use to revolutionize your organization. Users and organizations are generating new data at an unprecedented level. More than 90% of the known digital information that currently exists has been generated in the last two years. However, as the amount of data increases exponentially, the amount of functional information is not following at the same rate. Data isn’t useful if it can’t be clearly organized and understood by the target audience. Without processing, data is just a random number on a page, an uninteresting sales figure, or a list of unrelated terms. 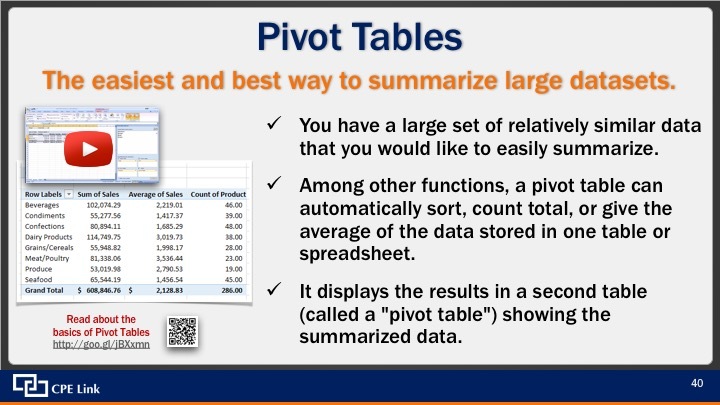 Effective Spreadsheets, Databases, and Reporting Tools for Financial Professionals will give participants the necessary skill to turn data into useful information and will examine the newest technological innovations for ways to store, retrieve, report, and analyze data using databases and reporting tools. Financial professionals will walk away from this course with valuable information and insights into understanding, managing, and utilizing data in an organized and meaningful manner.